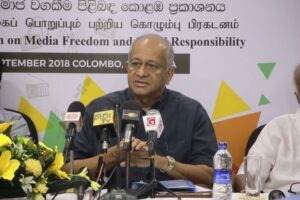 Representatives from nine countries will be attending an international conference from Sept. 27 to 30, 2018 to mark the 20th anniversary of the Colombo Declaration on Media Freedom and Social Responsibility organised by the Sri Lanka Press Institute (SLPI) in partnership with its constituent partners, UNESCO and the Royal Norwegian Embassy. The conference will also coincide with the UN designated International Day for the Universal Access to Information (IDUAI). The conference will be formally opened by Prime Minister Ranil Wickremesinghe on Sept. 27 and on Sept. 28, the keynote address on IDUAI will be Speaker Karu Jayasuriya followed by an address by Mr. Mahinda Gammanpila, Chairman RTI Commission. Speech by Minister of Media and Finance Opposition – Hon. Mangala Samaraweera M.P. The working sessions will be held at the Cinnamon Grand and the Mt. Lavinia Hotel and will be attended by local editors, publishers, journalists, academics and information technologists. Representatives from Australia, Bangladesh, Canada, China, Germany, India, Norway, Pakistan, and the United Kingdom will be participating. The 10 sessions that will cover the 3 ½ – days will include topics such as; Revisiting the Colombo Declaration of 1998; Regulating the Media; Public Service vs. Private Broadcasting, an event to mark the International Day for the Universal Access to Information, the RTI and the way ahead; Truth and Trust: Fake news and Media Credibility; Contempt of Court; Training and Preparing for the Future and Power of Journalism. Mr. Mizanur Rahman Khan, Joint Editor The Prothom Alo, Bangladesh. The last day will look at the achievements of the Colombo Declaration, take stock of what has been achieved and map out the way ahead. The international conference is supported by the media industry comprising; The Editors’ Guild of Sri Lanka (TEGOSL), Free Media Movement (FMM), Sri Lanka Working Journalists Association (SLWJA), Newspaper Society of Sri Lanka (NSSL), Press Complaints Commission of Sri Lanka (PCCSL), Sri Lanka College of Journalists (SLCJ), WAN/IFRA, Commonwealth Media Trust, Committee for the Protection of Journalists (CPJ) and the International Press Institute (IPI).